Wendy and Frank Godfrey at their retirement party in Redditch. A CAMPAIGNER who helped stop the demolition of Other Road by Redditch Development Corporation has passed away. Wendy Godfrey died on January 5 at the age of 90. 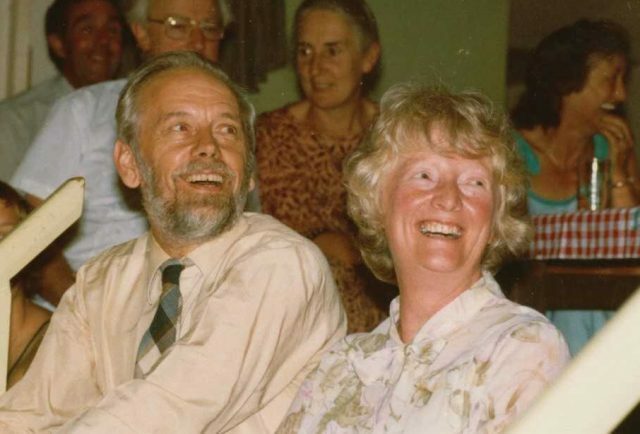 Wendy was the wife of Reverend Frank Godfrey of Bates Hill Methodist Church and then of the Ecumenical Centre after his church and the United Reformed Church were demolished. The couple arrived in Redditch in 1975 when the Development Corporation was busy constructing the new town. Wendy, a teacher and social worker, helped set up Reddishare for the disabled and was also involved with the charity PHAB – Physically Handicapped and Able Bodied – helping to improve access for wheelchair users. However she will also be remembered for taking on the might of Redditch Development Corporation, the Borough Council and Worcestershire County Council in the defence of the residents of Other Road. The road had been earmarked for demolition to complete the final leg of the town centre ring road. However the powers that be hadn’t reckoned with Wendy who together with other campaigners helped channel the anger of the residents into positive action to fight RDC. She wrote: “The Other Road community could walk to the town centre in minutes. They had known one another for years. “Theirs was the sort of community that the Development Corporation was spending vast sums to create in the new areas by employing a team of social development officers. Wendy found an ally in Councillor Walter Stranz as it dawned on RDC planners that they would be destroying a community of 90 homes. The issue was eventually decided at a free vote at Worcestershire County Council when to the campaigners astonishment they won by 39 votes to 33 and Other Road was saved. Wendy and Frank retired to Gloucester where Wendy’s funeral will take place at Christchurch, Abbeydale, Gloucester, on Thursday, January 31 at 11.45am.